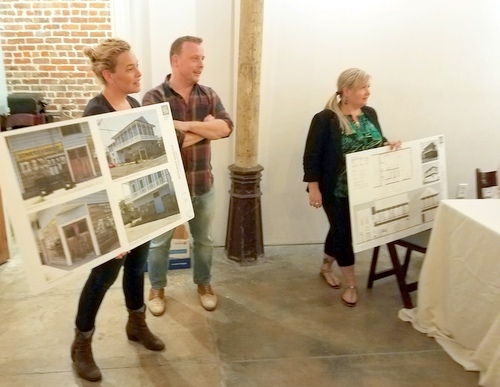 The co-owners of the beloved Coquette restaurant on Magazine Street received a warm reception Monday night as they introduced their idea for a new restaurant, “Thalia,” to their neighbors in the Lower Garden District. Kristen Essig and Michael Stoltzfus — co-chefs and co-owners of Coquette who were this year nominated together as semifinalists for the national James Beard Foundation Awards — told members of the Coliseum Square Association that the inspiration for the restaurant goes hand in hand with their relationship. Essig, who had also last year left her job as executive chef at Cavan to join Stoltzfus at Coquette, and Stoltzfus were looking for a home to move into together, when Stoltzfus visited the former Shamrock Bar at the corner of Thalia and Constance streets instead. The menu, they told the association, is still being developed, but they intend for it to have a mid-range price point where locals can feel comfortable dining regularly. The idea, they said, is to fit somewhere in between the city’s broad selection of po-boy shops and lunch places and its internationally acclaimed fine dining. It will have about 30 seats, with a holding bar of about seven seats. They intend to integrate the restaurant into the surrounding business community in that corner of the Lower Garden District as much as possible, Essig said. Coffee will come from French Truck and they will feature pastries from Debbie Does Doberge. Likewise, the name pays homage to the location as well. They will start small by serving dinner five nights a week, and grow the hours or even the uses of the building as they move forward, Essig said. In the future, for example, they may serve other meals like breakfast, or perhaps even turn the space during the daytime into a co-working location, she said. “We’d like to evolve the space instead of just saying, ‘We’re going to do everything all at once,'” Essig said. The building was one of the last segregated bars in the city, with separate spaces for white and black patrons, and architectural remnants of that legacy can still be seen. As much of that history — including the old advertisements on the outside walls — will be preserved and placed into context as possible, the owners have said. “We’re excited to bring it back but as a place that welcomes everyone,” Essig said. Neighbors near the property were initially skeptical about the project when owner Beverly House bought and began renovating the building two years ago — most recently used as a wood shop — but have since showed their support, House said. “This time around, especially knowing that we have Kristin and Mike coming in as the operators, everybody has been very supportive,” House said. Coliseum Square Association members’ chief concern was not alcohol sales or parking — the traditional clash points between neighbors and restaurants in the past — but how House plans to use the three residential units above the restaurant. They will be long-term apartments for permanent residents, House said, not ever used as AirBnB lodging. “I have no intention of having any short-term rental in the building,” House said. Julie Simpson, president of the Coliseum Square Association, said that the owners of the project have been willing to sign a good-neighbor agreement to address any remaining concerns, and praised the couple for being so eager to work with the neighborhood. Essig and Stoltzfus hesitated to name an opening date for the restaurant, with Essig saying it could be within six to eight months from now. With that, they ended their presentation to the association to a sustained round of applause.